Diagnostic imaging is a sleuth: It can identify cancer, confirm clinical suspicions and define disease parameters, leading the way to optimum treatment. Waves of technological improvement—better image quality and image processing/analysis software—continue to make treatment planning and radiation therapy delivery even more precise. Equally important is oncologic imaging—a cornerstone of cancer treatment that often combines real-time imaging with radiotherapy and radiosurgery through image-guidance. Oncologic imaging also assesses the efficacy of chemotherapy, and serves as a watchdog for cancer recurrence. The impact of innovations in all realms of imaging and radiation therapy is huge, and with ongoing advances, more cancer patients are alive and recovering than ever before. But with impending Medicare reimbursement reductions in 2015 comes an even greater need to identify cancers early and harness the best, most cost-effective treatments, while still aiming for the best patient care and experience. To forge ahead, Applied Radiology spoke with radiologists and medical physicists about the growing role multimodality imaging is playing in today’s effort to quickly detect, diagnose and follow treatment in the areas of transarterial chemoembolization (TACE), lung cancer screening and breast MRI screening. We also examined the promise of Superb Micro-vascular Imaging (SMI); wide-bore CT and MRI systems; PET/CT, and software tools for dose reduction, 3D and 4D visualization, and perfusion imaging. About 18,500 cases of primary liver cancer are diagnosed in the United States each year, the majority of which are hepatocellular carcinomas (HCC), according to the Society of Interventional Radiology (SIR). 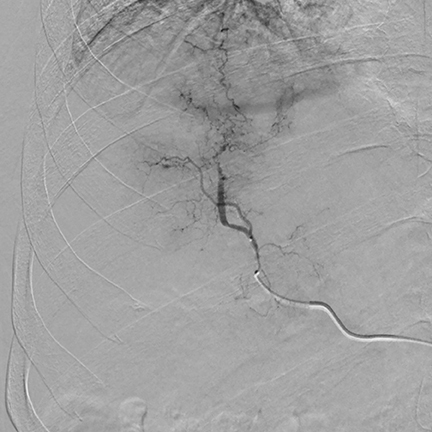 Radical resection and radiofrequency ablation (RFA) are preferred treatments, but chemoembolization is used when a tumor is too large or in a location not treatable with RFA. With advanced hepatocellular carcinoma, TACE is used extensively for treatment. A multi-phase interventional CT scan is first performed to characterize the lesion or lesions in the liver. The IRCT can also help identify which blood vessel is directly supplying the tumor and can verify that the vessel about to be embolized is not supplying another area, such as the stomach or abdominal wall, since this could create complications. 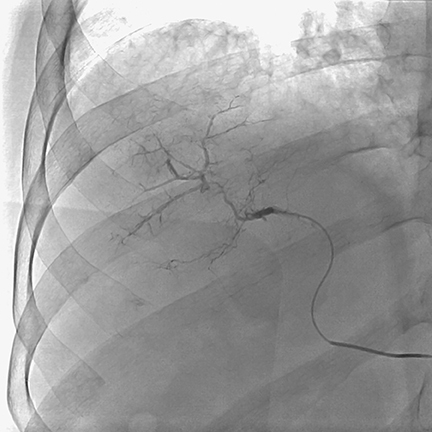 During a TACE procedure, interventional radiologists use image guidance to thread a tiny catheter up the femoral artery in the groin and into the blood vessels that are supplying the tumor. The chemoembolization delivers a high dose of chemotherapy directly to the liver while depriving the tumor of its blood supply by blocking the hepatic arteries feeding the tumor. Dr. Joseph said that new catheter-based technologies have been developed that allow a tumor to be embolized with a higher concentration of chemotherapy than could have been used with a conventional catheter. This multimodality approach also allows for an immediate follow-up study to show how the embolized material is concentrated in the tumor. “This is a type of double confirmation that we appropriately embolized the tumor,” he said. 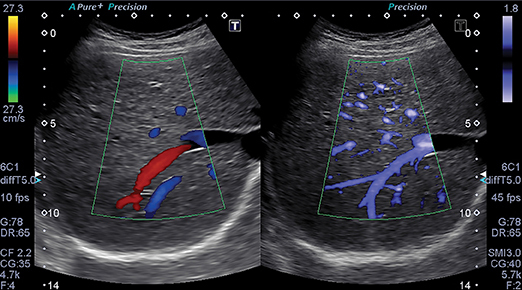 The ability of ultrasound to better characterize tumors, visualize fine blood vessels and detect micro-vascular blood flow in the liver, kidney, abdomen and lymph nodes is showing promise with Toshiba’s new ultrasound technology—Superb Micro-vascular Imaging. SMI was introduced at RSNA 2013 as a works-in-progress with its Aplio 500 system, and is now FDA-cleared. SMI overcomes the limits of Doppler techniques for evaluating microvessels. It is a micro-vascular flow imaging mode designed to improve the visualization of blood flow, especially slow flow signals from microscopic vessels. 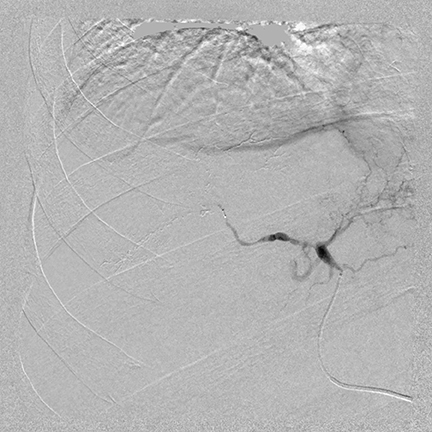 The technology shows microvasculature in high resolution and with very fine detail. It also removes motion artifacts or clutter while visualizing low velocity blood flow at rates over 50 frames per second. Adrian Lim, MD, FRCR, adjunct professor of radiology and chief of ultrasound at Charing Cross Hospital of Imperial College Healthcare in London, England, has been evaluating SMI since 2012. 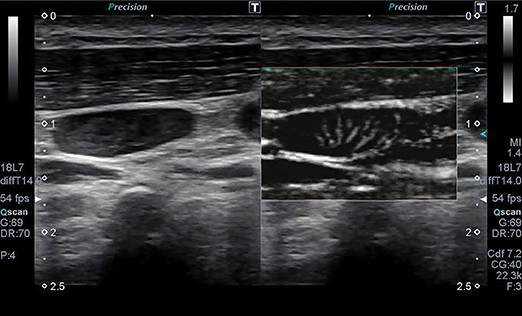 Doppler ultrasound is a quick, non-invasive, and inexpensive method of assessing the vascularity of tissues and tumors. In addition to its fine image detail, he sees SMI as being advantageous for patients because no contrast agents are needed to evaluate lesion vascularity. “I think that this technology will have a real impact in the assessment of kidney lesions,” said Dr. Lim. “It is very important to know if a kidney lesion is vascular or not. If it is a vascular solid lesion, it has to be biopsied or removed. If it is a complex solid or cystic lesion that has no vascularity, most physicians are willing to observe and follow up. Dr. Lim also noted that SMI may be useful for complementing power Doppler ultrasound to determine whether vascular liver lesions are benign. For example, it may be able to aid the diagnosis of focal nodular hyperplasia. Depending on the country where the exam is performed, use of SMI may be able to help avoid a biopsy of a breast lesion that has benign appearances, such as a fibroadenoma. “In the United Kingdom, a biopsy on all solid lesions is required. However, in the United States, a physician may recommend that a benign-appearing lesion could just be reimaged 6 months later,” said Dr. Lim. “In these circumstances, SMI may help with the decision on whether to biopsy or follow up. Breast cancers are complex, but an organized blood flow pattern detected with SMI may help distinguish a benign from malignant lesion, although this needs further investigation. One other aspect in which SMI may be useful is monitoring treatment response in vascular malignant tumors. This, however, would require developing a quantification tool that would preferably provide a volume assessment of the neoangiogenic vessels. In certain circumstances in which a re-biopsy of a lesion is required, then the presence of vascularity within the tumor detected by SMI may help target the site for sampling. Jiro Hata, MD, professor of clinical pathology and laboratory medicine at Kawasaki Medical School in Okayama, Japan, used SMI to improve contrast-enhanced ultrasound (CEUS) to track new blood vessels and flow patterns of a scirrhous tumor. He also was able to display the tumor vessels of a small malignant skin melanoma and a squamous cell carcinoma on the face. Such use of SMI is expected to reduce the use of disfiguring biopsy. Certainly, technology’s role is paramount in cancer detection and treatment, but the patient experience is an important consideration as well. With CT and MRI exams, unless a patient is claustrophobic, he or she probably doesn’t think much about a single imaging experience. But oncology patients, especially if large or obese, may be far more aware of the modality and procedure since they have likely undergone numerous imaging exams. Ensuring that imaging and treatment processes are easy, comfortable and efficient for these patients remains an important goal. And with MRI scanners, fewer children may require anesthesia since a parent can touch and soothe them during a procedure. In addition, with improvements in acquisition technology, procedures in these systems may take as few as 15-25 minutes instead of 50. Toward this end, wide-bore scanners with a broad true field of view (FOV) accommodate patients without truncating and/or distorting body contour during image acquisition in radiotherapy simulation set-up. Body contour integrity is one of the critical requirements in radiotherapy dose calculation. A 90-cm bore, such as the Toshiba Aquilion Large Bore CT simulator, can also accommodate patient fixation and immobilization devices. These devices include flat table tops, incline breast boards that enable the patient to be raised up to their comfort or allow one or both arms to be sideways for more precise lymph node imaging, bulky immobilization cradles used to position prostate cancer patients or patients for stereotactic body radiation therapy (SBRT), and bulky frame/frameless head immobilization devices. Larger bores can mean better images. Scanners that produce 0.5 mm slices in axial scans not only deliver improved image quality, they also help identify smaller lesions, particularly in stereotactic radiosurgery (SRS). A scanner with a true FOV maintains body contour integrity, which cannot be reproduced by scanners that use software to extrapolate or post-process the truncated FOV. Such accuracy is of critical importance for radiotherapy treatment planning, emphasized Eugene Chung, MD, PhD, a radiation oncologist at the UCS Norris Cancer Hospital and assistant clinical professor at the UCS Keck Medical Center in Los Angeles, California. PET exams also play a significant role in verifying cancer remission, recovery, disease progression and recurrence. It’s important for the radiology department team, as well as patients and their oncologists, to know that the procedure is performed as quickly and comfortably as possible, while rapidly acquiring highly detailed images with as low a radiation dose as possible. Toshiba kept these factors in mind when it introduced a large bore PET/CT system in June 2014, the Celesteion. The system has a 90-cm CT and 88-cm PET bore, a 450 ps time-of -flight resolution for PET imaging, a 0.5 second rotation with 0.5 mm detectors producing 32 slices, and a 70 cm true CT and PET FOV with the ability to extend to 85 cm for CT exams. Before receiving FDA 510(k) clearance, the system was clinically evaluated at Steinberg Medical Imaging, an outpatient imaging center in Las Vegas, Nevada, that was searching for a system to perform tumor detection, treatment evaluation, CT simulation and follow-up imaging. As with CT, the role of PET as a key oncology imaging modality keeps expanding, including its anticipated use in research initiatives to create individual and personalized treatment for cancer patients. At the annual meeting of the American Association of Physicists in Medicine (AAPM) in July, researchers from Memorial Sloan Kettering Cancer Center in New York described how they used radiomics to help determine radiation therapy dose more accurately for patients with non-small cell lung and head-and-neck cancers. Radiomics is a data analysis technique that extracts subtle mathematical characteristics of the appearance of a tumor shown on PET images. Joseph Deasy, PhD, chair of the department of medical physics, said that by using statistical modeling based on the extracted mathematical properties, they were able to predict how much radiation dose was required for a specific tumor. 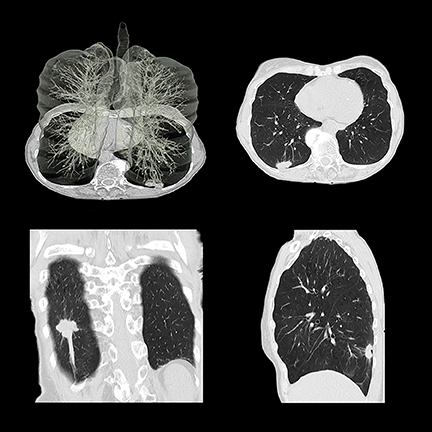 Toshiba’s Adaptive Iterative Dose Reduction 3D (ADIR 3D) software is also lauded for bolstering imaging safety. The software employs an array of adaptive and integrated dose-reduction strategies at each stage of the CT scanning process. All patients benefit from a significantly reduced radiation dose that produces high-quality images. Furthermore, for some exam protocols, image quality is better with a very low dose when dose-reduction algorithms are used, noted Cecelia Brewington, MD, professor and vice chairman of imaging services at UT Southwestern Medical Center in Dallas, Texas. Excitement is also mounting over wide-volume image scanners with rapid image scan speeds and software that enables perfusion imaging. “A CT scanner that can cover 16 cm of distance from head to toe for a perfusion study in a single revolution is allowing us to look at how blood flow goes to a tissue, how fast it gets there, how long it sits there, and how it clears,” said Dr. Brewington. Of added interest in perfusion imaging, a presentation at the 2014 International Symposium on Multidetector-Row CT held in June in San Francisco, California, described how pancreatic imaging with CT perfusion identified dangerous tumors that were difficult to see with conventional CT. Researchers from Radboud University Medical Center in the Netherlands also reported that CT perfusion was able to detect isodense tumors, identify adenocarcinoma from other focal lesions, and differentiate low-to-high grade tumors. 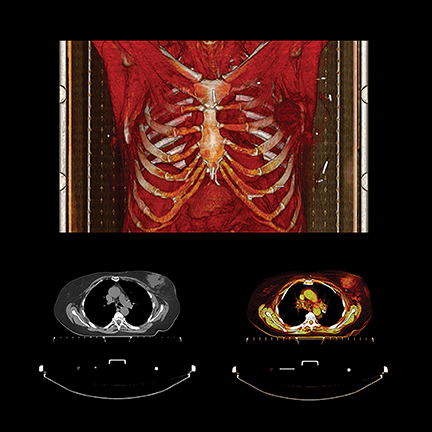 Earlier this year at the 2014 European Congress of Radiology held in March in Vienna, Austria, Turkish researchers described how CT perfusion could be used to evaluate esophageal cancers with small tumor diameters. Meanwhile, Christopher Lee, MD, cardiothoracic radiologist at the UCS Keck Medical Center in Los Angeles, California, and his colleagues, have begun researching perfusion imaging of lung nodules in lung cancer patients, and are enthusiastic about potential results. The USC Keck Medical Center, UT Southwestern Medical Center, and SUNY Upstate Medical University have implemented lung cancer screening programs. Dr. Lee said that scans are performed at an even lower dose than that used for the National Lung Cancer Screening Trial, thanks to the use of iterative reconstruction. Patient volume is currently modest but has picked up as a result of media attention and endorsement by the U.S. Preventive Services Task Force (USPSTF). Dr. Brewington said that lung cancer at its earliest stages has been identified in a few patients; but for most, overall results have been negative. The lung cancer screening program is combined with a smoking cessation program focusing on behavior modification. To the staff’s surprise, patients were not returning for annual screening, which prompted a telephone reminder program. For breast cancer screening, while low volume remains the norm for MRI screening overall, numbers are improving. MRI screening for women at high risk for breast cancer has jumped significantly since it was recommended by the American Cancer Society (ACS) as a supplement to mammography in 2007. The growing number of states—19 as of August—that have passed legislation requiring radiologists to report dense breast tissue revealed at mammography will further boost breast MRI screening. Currently, about 40% of women have dense breast tissue, but 95% of all women don’t know their own breast density, according to the national organization, Are You Dense Advocacy. This group also reports that fewer than 1 in 10 women with dense breasts learn about this condition from their physicians. To address this problem, the Breast Density and Mammography Reporting Act, introduced in the U.S. House of Representatives in 2011 and again in 2013 by Representatives Rosa DeLauro (D-CT) and Steve Israel (D-NY), would set national reporting standards and help raise awareness of breast cancer risks for women with dense tissue. In mid-July, Senators Dianne Feinstein (D-CA) and Kelly Ayotte (R-NH) introduced similar legislation in the U.S. Senate, which also directs the U.S. Department of Health and Human Services to study improved screening options. Also encouraging, The University of Texas Health Science Center at San Antonio, which treats many low income and indigent patients, has procured funding from the State of Texas to provide free MRI breast screening for high-risk women lacking insurance or money to pay. “We screen all patients who come for a mammogram to determine their risk level based on [American Cancer Society] criteria. If a patient is at risk, we call her referring physician, talk with the patient about the importance of supplemental screening, and schedule a breast MRI appointment before she leaves our department, if this is what we recommend,” said Pamela Otto, MD, radiology department chair at the center. Very high risk patients are referred for genetic counseling, which helps identify other women in their families who may also be at high risk and not know it, she noted. Assessing risk level also helps alleviate concern for women not at risk. Because tumors and fat both appear white, tumors can be difficult to differentiate. MRI technology has also witnessed the benefits of fat suppression technology. Toshiba’s slice-selective fat suppression is advantageous because fat is suppressed on each individual slice. Instead of using one value of a uniform fat peak—which can produce both optimum and less than optimum images—excellent fat suppression is exhibited on each slice, aiding the diagnosis of tumors. 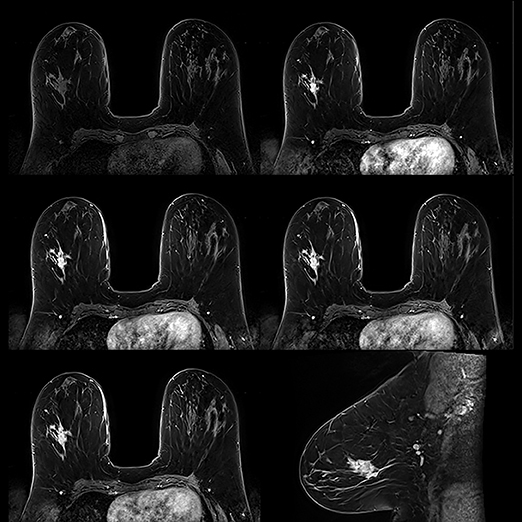 “Much of the value of using MRI for breast examinations is due to the ability of MRI to simplify the heterogenous presentation of breast parenchyma by using fat suppression to produce images that feature the glandular tissue,” said Geoffrey D. Clarke, PhD, medical physicist at University of Texas Health Science Center. Promising news continues to pulse throughout radiology thanks to innovation, collaboration and a greater understanding of imaging technology and its myriad benefits. Indeed, radiologists and their team can deliver optimal results by continually exploring modalities and related tools that improve oncologic imaging and, ultimately, patient care. From TACE applications, SMI advances and wide-bore systems, to screening programs, software benefits and beyond, oncologic imaging is poised not only for continued success—but greater success—in cancer detection, eradication, and the complete patient experience. Berg WA, Zhang Z, Lehrer D, et al. Detection of breast cancer with addition of annual screening ultrasound or a single screening MRI to mammography in women with elevated breast cancer risk. JAMA. 2012; 307:1394-1404. Chiarelli AM, Prummel MV, Miradali D, et al. Effectiveness of screening with annual magnetic resonance imaging and mammography: Results of the initial screen from the Ontario High Risk Breast Screening Program. J Clin Oncol. 2014; 32:2224-2230. Yee KM. 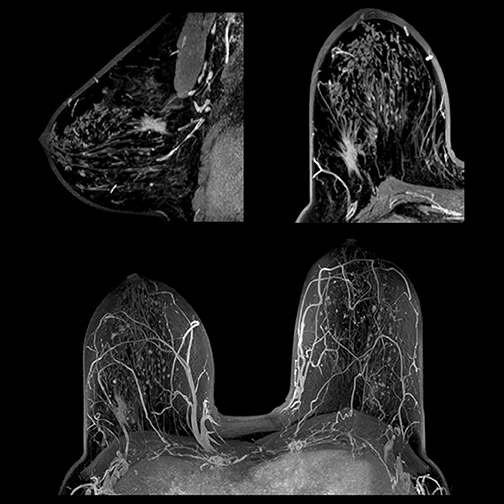 New breast MRI exam ready to screen women with dense breasts. AuntMinnie.com, http://www.auntminnie.com/index.aspx?sec=ser&sub=def&pag=dis&ItemID=105131, Published October 16, 2013. Accessed August 8, 2014. Tieu MT, Cisgar C, Ahmed S, et al. Breast cancer detection among young survivors of pediatric Hodgkin lymphoma with screening magnetic resonance imaging. Cancer. 2014; 120(16):2507-2513. A multimodality approach to oncologic imaging. Appl Radiol.